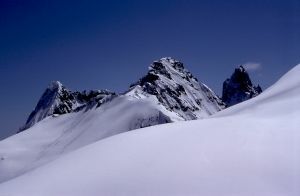 Located north of Slesse on the Slesse -Nesakwatch divide, this rugged peak forces those traversing the divide to cross over from one side of the divide to the other, hence the name. Crossover's east ridge is used by parties without bicycles in Slesse Creek, to descend back down to Nesakwatch Creek and their vehicles. It is notoriously difficult to route find down this ridge in the dark, and many parties attempting to do Slesse NE Buttress in a day have ended up bivying somewhere on this descent.